You probably know that October is “Breast Cancer Awareness Month”. Before this month runs out, then, I need to post an essay by a wonderful friend of mine, Jenny Gooch, who is on a journey with breast cancer. Jenny is a literacy coach at James Lewis Elementary School in Blue Springs, MO. I have known Jenny for six years, and she has been a loyal participant in the summer writing institutes I lead there every year. Jenny is a wonderful writer. She posted these thoughts on Facebook one day, meaning to share with her circle of friends (who number in the 660’s) how she was feeling as she was going through chemotherapy for breast cancer. I wrote her to say that she had written an essay, and would she mind if I put it on my blog. It took me awhile, but I need to post this today because today is another critical day in her life, and I can’t stop thinking of her. A few words about the craft of Jenny’s essay: she writes in first person and in present tense, which makes it so familiar that it speaks to many who know what it’s like to live inside serious illness. Surprisingly, it is funny and clever, and it’s the first piece I’ve read that talks about emojis as metaphors for states of being. Jenny’s voice is honest and angry, and if you knew her, you would never, ever use the word “angry” to describe her, for she has a positive, loving light in her at all times. But in fact, her indignation rises as she notes how she usually posts positive updates, as if she is HAPPY about her condition. The rant builds in a list of sentences, all beginning with the phrase “I’m not happy [about this and this and this],” and it seems as if the act of writing and poring out that anger is helping her. And then Jenny realizes something quite important and deep and true about what she is doing and how she feels, and it was inspired by a quote from her reading of the Bible. Today I post Jenny’s essay in gratitude for her courage to share her journey, and in honor of all the women and men who are living with breast cancer, and especially in honor of four dear friends of mine. You are always in my mind and heart, and I am grateful every day for your lives. At this point in my journey I think I can describe my feelings with those cute little emojis that everyone loves to text, post, and email. I’ve had a lot of smiley face days when I truly feel happy. A lot of heart days where I feel loved or want to share love. I’ve had a lot of those little flexed muscle days where I feel so strong. I’ve had a lot of the palms together, hands of prayer days where I feel covered in prayer or find strength from praying. I’ve had a lot of cross emoji days, where I feel blessed more than I can ever describe, and I know I need Jesus in my life now more than ever. I’ve had a lot of clapping hands days were there is much to celebrate. And a lot of pink ribbon and heart days when I’m reminded that I have breast cancer and that my life will forever be changed. In the world of emoji I’ve had it pretty darn good. But let’s get real friends. I’ve also had a lot of the crying face days. And the sleepy guy face days. Days I just want to answer the question “How do you feel?” with the thumbs down emoji. And my favorite…the little poo emoji. Yep, I’m saying it…there are days I just feel like poop. Terrible, can’t get off the couch kind of days. Maybe I can create a couch potato emoji. That would be perfect. In reality, more days have been positive emoji days than negative. And I’m definitely ok with admitting this journey has been full of both. I promised myself that I would share as much as I was comfortable sharing on this journey, which for me means I need to share the good, the bad, and the ugly! So here goes…this has been weighing on my mind for weeks now. I need to be honest. I’ve worried the last couple months that I’ve given everyone the impression that chemo is easy or that I’m happy about the journey that has been set before me. I’m going to try to be really transparent here. I am definitely not happy. Don’t let my smiling chemo day photos fool you. AND chemo is definitely not easy, fun, or anything to be happy about. To be completely honest…it stinks. I’ve had a couple of rough weeks. Which have come with some good cries. I have even mumbled the words, “I don’t want to do this anymore. I just want to be done.” There are days I think, “I don’t want to be an inspiration. What’s your plan for me God?” There are days I just want to get back to being me and feeling normal. But those moments are short and usually come on days I feel my worst as far as being “sick”. Several weeks ago I was really struggling with this thought of being happy. I generally consider myself a pretty happy person and it takes a lot to keep me down for long. I had found myself scrolling back through my Facebook posts reading about my cancer journey thinking…man, I do look pretty happy. In no way do I want anyone to think that I am happy about any of this. Then why all the smiles? Why the “happy” posts with my amazing chemo crew? Am I making chemo look fun? I never, EVER want those who have walked this path before me, or those who will walk behind me someday to think that I have taken this journey lightly or made it seem like a good time. So why the smiles? And am I… happy? It’s not about PRETENDING to be happy, but CHOOSING to be positive, which helps overcome challenges, which leads to…JOY! So I have convinced myself with the help of the Bible that…NO, I am not pretending to be happy. I’m not happy about having cancer and putting my life on hold. I’m not happy that I have to endure 16 total chemo treatments. I’m not happy that I had to miss my family beach vacation with my best friends. I’m not happy that I lost my hair. I’m not happy that I have no energy to play with my kids most days. I am not happy that many foods taste terrible to me and sometimes—even water tastes weird. I’m not happy that I have been fighting mouth sores. I’m not happy that I have terrible hot flashes and night sweats that keep me from sleeping well. I’m not happy that walking up the steps in my own house makes me out of breath. I’m definitely not happy about any of this. But I can take every single one of those things and CHOOSE to be positive about it instead of dwelling on how terrible it all feels. I find myself thinking and saying…it’s only one summer. It will all be over soon. Carter couldn’t go to the beach either, so we are lucky to get all this over with at once. I’m blessed to have the financial means and access to good medicine and doctors. Those 16 chemo treatments? That means 16 opportunities to spend one-on-one time with some of amazing friends and family members. Bald is beautiful. Trying out different scarves and hats is good retail therapy. Getting ready for work is going to be so quick and easy. Thank goodness for wigs! My kids are learning so much about supporting someone in need and taking care of family. Since food doesn’t taste that great maybe I will finally stick to eating healthy. I’ve kicked my Diet Coke addiction! I will never take exercising for granted again. I could go on and on. This journey WILL and already has made me stronger and more positive. I’m so glad I stumbled across those verses in James to make me realize that I was not, and am not, pretending to be happy, but instead choosing to be positive. And if that looks like joy, then I can live with that. And most days I can do it…choose to be strong and positive. I have a few bad days where I feel sorry for myself, but someone is always there to pick me back up. I used to feel guilty for feeling down. But everyone says I’ve earned it. So I just have to believe and pick back up the next day. And by the grace of God I get a do- over each day. I’m going to continue to work hard each day to choose joy. Thank you all for being part of my team. Without you, choosing joy would be impossible and pretty lonely. In this post, I want to publicly thank some people who generously offered to write essays for my new book. Their writing makes The Journey is Everything a unique, useful, and beautiful book. Two of them reside in Chaper 1: “Joyas Voladuras,” by Brian Doyle, and “Pride,” by Dagoberto Gilb. These are two of my favorite published essays—I’ve been using them with teachers and students for years, and I am grateful to the authors for granting permission to include their pieces in full. The others reside at the very end, near the Appendix, where I have appended a set of incredible essays, written for young people, ages 8 to 18, that can be used as mentor texts for their own writing. The essays are funny, informative, angry, quirky, moving, even tear-jerking. All the things that essay can be. Authored by people in the fields of children’s literature and literacy education, some of their names will be quite familiar to those who read professional books about teaching writing and reading. And some, if you do not know them yet, will become familiar because they are fantastic writers. This is not the only place you can read them, and you will want to go find their work in the world: novels, poems, picture books, and books that help us teach. 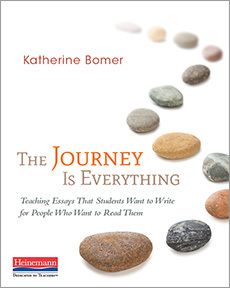 From: The Journey is Everything: Teaching Essays That Students Want to Write for People Who Want to Read Them. 2016, Heinemann. I am extremely honored to sit inside the same book with all these writers, and I am overjoyed to share their essays with teachers and students.